The Big Breeze Bike ride! On the weekend of 23-24 June 2012, Breeze are organising the UK’s first ever event to get thousands of women riding a bike at the same time! Join us Sunday 24th June in East London! 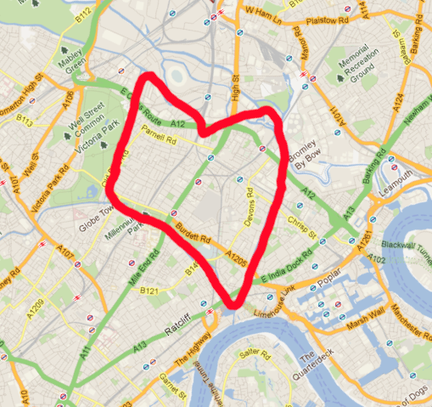 This scenic 7 mile heart route will take you on a lovley off-road route all the along the canals of east London, through the scenic Limehouse Basin, historic Three Mills and right past the Olympic stadium! We will finish the ride with some well earned cake and coffee at the gorgeous Lakeside Pavilion in Victoria Park...or maybe even a ice-cream! This event is now over! A huge thank you to all the ladies that came along! visit the Breeze site, pop in your post code, and find a ride in your local area! Or just grab some friends and go for a spin! The British Heart Foundation has partnered with British Cycling for the Big Breeze Bike Ride! heart-shaped route with some friends! You can help by signing their current petition campaign calling for young people to be taught Emergency Life Support (ELS) skills in school, after footballer Fabrice Muamba, received CPR when he collapsed during a match.